Hi friends, after the success of Spotlight: Summer food & drinks event, I have disappeared from blogging world and was fully enjoying my parents' stay with me. Yes, they are visiting me in Singapore for first time and I got to meet them almost after 9 months. My toddlers have enjoyed the most. They are enjoying and taking advantage of their grandparents' presence in every possible way. They have become more naughtier and active than before, not listening to me at all. I am not allowed to scold them a bit and they understand that and taking great advantage of it. Grand parents are supposed to spoil their grand children, right? And my parents are no exception on this matter. Any way, I am also enjoying the food prepared by my mother after long time and relishing it. But, it is not going to last for long. They have to leave us and we are going to miss them, especially my kids. 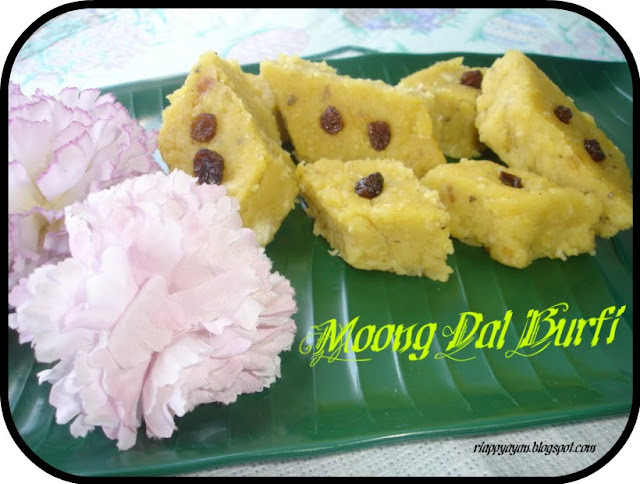 Any way, I would like to share with you all today one amazing sweet dish made by my mom during her stay, i.e., Moong Dal Burfi. This moong dal burfi is a special treat sweet, commonly made during festival time or on birthdays or anniversaries, etc. 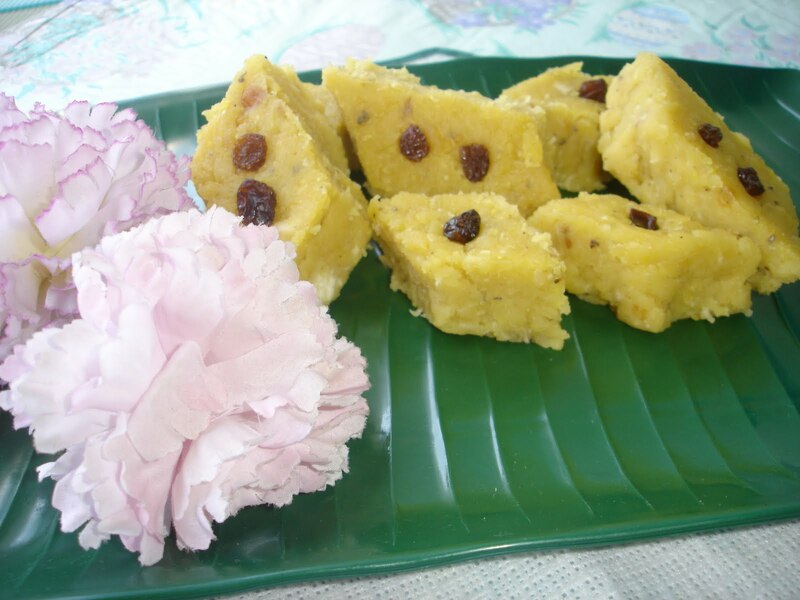 Burfi or Barfi, is a Indian sweet made from milk, different nuts like Cashew nut or Pistachio burfi, from different lentils like Moong dal(yellow lentil) Burfi or Chana dal Burfi. 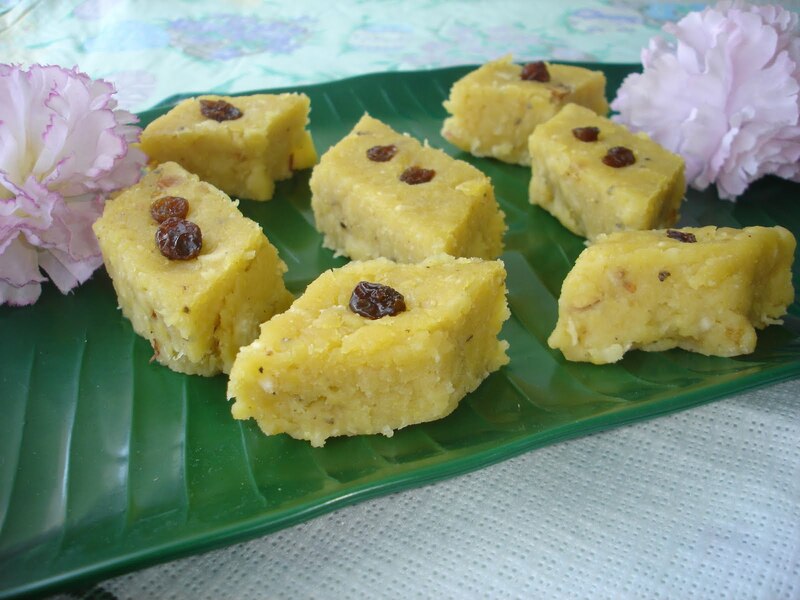 burfi is often flavoured with fruit like Mango or Coconut. Visually, they are typically cut into square or diamond shapes. This sweet needs very less ingredients and real easy to make. 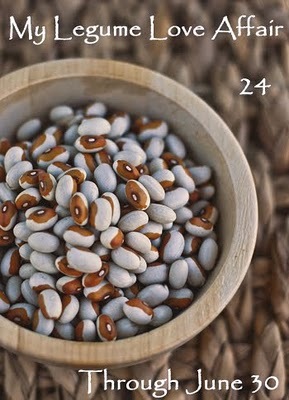 It can be stored in refrigerator for quite sometime, like 2-3 weeks. Ghee(clarified butter) : 2-3 tblsp. Soak moong dal in hot water for 2-3 hours or in cold water 4-5 hours. Drain water fully, spread the dal on a wide plate for some time. Then heat a non-stick pan, add 2 tablespoon of ghee, when ghee heats up, add the dal. Stir continuously till all water dries up and dal starts to change colour to light brown. This process takes about 10 minutes. Remove from heat, cool for sometime. Then grind the dal in a lender, little at a time, adding minimum water to a fine paste. Heat the same pan again, add rest of the ghee and oil, then add moong dal paste into it. (You can use ghee instead of oil in this step, but I try to reduce the intake of it and so substitute with oil.) Stir continuously in a medium heat until all moisture evaporates. After stirring for 5-6 minutes, add shredded coconut. Slowly stirring continuously, fold all coconut into the paste. Then add condensed milk into it and fold again. Stir again and still you will see the paste is sticking to the pan. 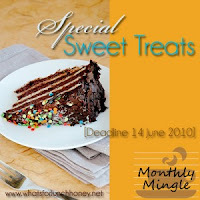 Check the sweet level and add sugar now if you feel it is not sweet enough. Add nuts in between. Stir continuously, taking care it does not burn, until mixture doesn't stick to the pan anymore and at this time, you'll be able to gather the whole mixture and make a ball. To check that the mixture is done, take a little portion of the mixture and try to make a ball on your palm, if it does not stick to your palm, that means it is done. Remove from heat, add grounded cardamom powder. Mix well. Grease a plate with little ghee/oil/butter, pour the mixture on the plate. Spread evenly on the plate. Let it cool for 5-10 minutes, then cut with a knife into square or diamond shape. Decorate each piece with rainsins or cashew nuts or pistachios. Alternatively, avoid the above step and make round balls from the mixture when it still touchable hot. Decorate as you wish...enjoy this delicious treat, all your hard work will be paid off when these burfis will melt in your mouth. Meeta of What's For Lunch, Honey? Oma! Ki perfect dekhte lagche barfigulo Indrani! Shajiye rakhte icche korbe ... khabo ki? Heyy ! 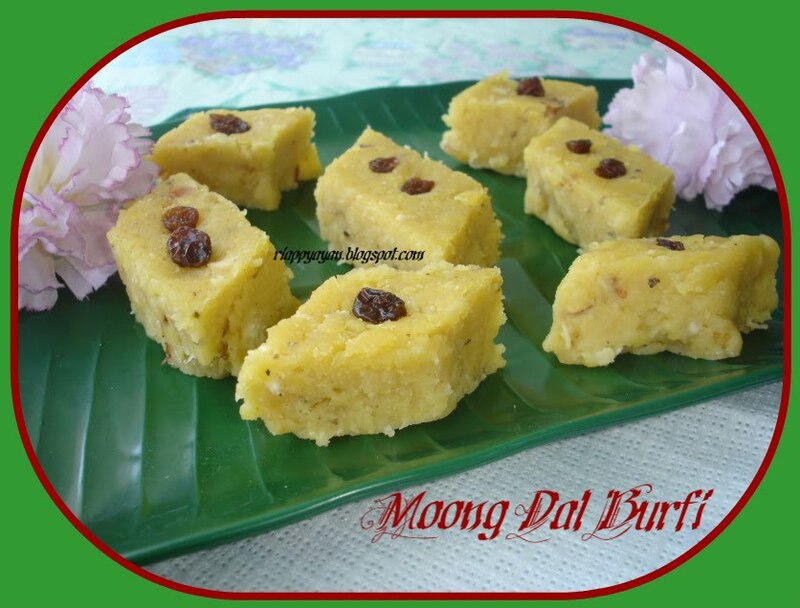 I was googling moong dal halva and saw moong dal barfi at the bottom of the result...and i thaught, why not ? read ur recipe n tried with minor changes , it turned out scrumptious ! thanx a ton for beautiful recipe...surely a keeper and very well described too . eirom kore amio banai. ki bhalo hoy khete. Wonderful! I am surely trying out this recipe this week! Though I have tried moong daal ka halwa, but this will be something new and more fun ! Thank you for the share!